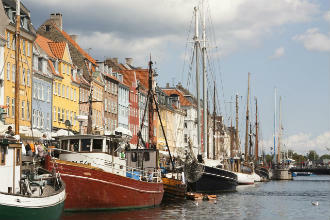 With more than 400 islands and close proximity to productive fishing grounds, Danish fisheries have historically been one of the top producers within European Union member states. During the two decades preceding ITQ management, Denmark attempted to reduce capacity and curb overfishing by decommissioning vessels and enacting policies limiting vessel entry and investments in vessels. While a reduction in gross tonnage was achieved, efficiency did not increase and biological goals were not met. From 1994 to 2002, overall catch and catch rates steadily declined, showing no evidence that the fleet reduction program led to increased catch opportunities, which had been a key goal. In 2003, the Danish government introduced an ITQ program for the Danish herring fishery and in 2007, extended the system to cover additional pelagic species including mackerel, horse mackerel, sprat, pout, sandeel and blue whiting. At the same time, managers introduced an ITQ program for the Danish demersal fisheries. Under ITQ programs, the capacity in Danish fisheries has dropped 25% without the use of public funds for decommissioning. Profits have increased from 9% to 20%, and fishermen have doubled new investments in value-added efforts. The program includes a number of design features to support the coastal fishery, which is comprised of smaller, nearshore vessels. Since the ITQ program began, the coastal fishery has increased its shares, providing these fishermen with greater access and bringing success to coastal communities. Important features of the catch share program include quota set-asides for small vessels and new entrants; fishpools, which promote cooperation and coordination among participants; and discard reduction programs.